L Thorius Balbus was a moneyer who hailed from Lanuvium, where there was a cult of Juno Sospita. Cicero describes him as a man who lived in such a manner that there was no pleasure, no matter how rare, that he did not enjoy. He was possibly the son of M. Aclius Balbus (168 BC). 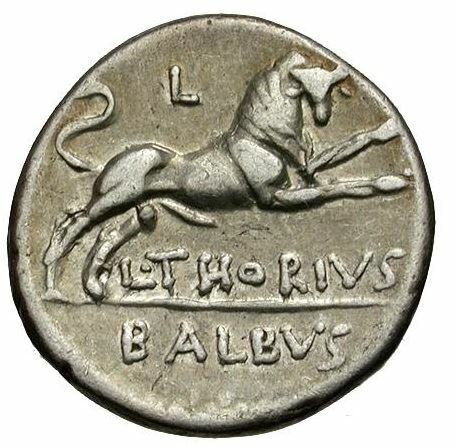 Gens Thoria was a Roman family which used as a badge the bull (taurus) due to the similarity between the words 'taurus' and 'Thorius'. The cognomen 'Balbus' literally means 'stammerer', and was used to denote a particular branch within the Gens.